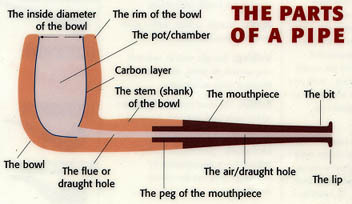 The process of filling a pipe is simple, yet important to smoking pleasure. If the chamber is packed too tightly with too few air spaces the pipe will go out easily and have to be relit often. A pipe packed too loosely will burn hot and fast. The proper way to fill your pipe is in pinches. The first pinch at the bottom should be tamped down with your fingers ever so lightly to leave a maximum of air between tobacco leaves at the bottom of the bowl. Tamp the second tamp down a little more firmly, the third tamp more firmly still, and so on till the pipe is filled. However, when you “break in” a new pipe, the pipe is only partially filled with tobacco – this is covered in more details in one of the following paragraphs. The way you fill your pipe will depend on the tobacco you are using. Ribbon cut tobacco holds more air and should be tamped a little firmer. A coarse or plug tobacco may leave too little air and smoke slower, requiring relighting if not filled with care. Good fresh tobacco will pack tightly and may also form blockages and areas in the chamber with too little air for proper combustion. Dry tobacco will fill easier, but will smoke hotter and less enjoyably. As you fill the pipe, draw through the mouthpiece to check on the air flow. If it draws too easily, tamp down a little more firmly. If it is difficult to draw, empty your bowl and start again or you will find yourself constantly relighting your pipe. Filling one’s pipe is an art in itself. As your expertise grows you will find your skill a source of great satisfaction. Your goal is to light the entire tobacco surface evenly. This can be accomplished in three steps. First spread the flame from a wooden match or lighter evenly in a circular motion across the tobacco, drawing on the mouthpiece with long draws. Then smooth and tamp down the burning tobacco across the entire surface. Finally, relight the tobacco again spreading the flame as evenly as possible. Ideally, after each smoke a pipe cleaner is run though the mouthpiece, down the length of the air channel and through to the base of the bowl. With Peterson System pipes, it should be used to clean the reservoir where most of the moistures accumulate. The pipe should then be left to dry, since the briar or meerschaum absorbs some of the moisture produced during smoking. After a few smokes, every pipe should be rested a day or two to allow the absorbed moisture which has accumulated in the pipe to evaporate. This is why you need more than one pipe to smoke in rotation and why most pipe smokers have up to a dozen or more. For a more complete cleaning an alcohol based liquid, rum, brandy etc. can be used to clean the pipe which should then be left to dry thoroughly, Periodically, a pipe should be disassembled and cleaned scrupulously. Always do this after the pipe has been allowed to cool and be careful to disengage the stem from the bowl by gently twisting, not pulling the two apart. Leave the pipe unassembled to dry out. Breaking in your new pipe is a crucial step in making a sweet tasting, long lasting pipe. It takes time, patience and skill. But it is an investment whose rewards will be reaped many fold. The goal when breaking in a pipe is to develop a uniform cake around the wall of the entire smoking chamber or smoke hole. The cake is actually a carbon deposit left by the smoked tobacco rather than charred wood. The cake serves to insulate the briar and reduces the possibility of burning out your new pipe. The cake also sweetens the pipe, since the carbon is formed from the sugars in the tobacco. The sweet cake absorbs the flavour of the briar and the result of smoking a pipe with a well formed cake is a mellow, sweet smoke. However, you can have too much cake which is discussed later. The second and most important step is to fill the pipe only one-quarter full. Light the partial pipeful evenly. Tamp down the burning tobacco and again light the tobacco evenly. Smoke the pipe slowly and completely. Taking long, slow draws will help to form a good, even cake. It is important to smoke the pipe to the bottom to establish the cake all the way to the bottom. The cake at the bottom of the bowl is the most difficult to develop and this is why such care must be taken in the breaking in process. After smoking a few pipefuls at one-quarter, move up to smoking at one-half full, then several at three-quarters. Allow the pipe to cool after each smoker and after a few pipefuls remove the residue from the bottom of the bowl. This must be done very carefully so as not to disturb the cake which you have obtained with your efforts. The purpose of gradually increasing the tobacco level is twofold – first, it will help form an even cake from the bottom to the top of the bowl and second, it ensures that the new pipe will not become overheated and burn out before it has a thick enough cake. Do not allow too much carbon to form inside the bowl as this may cause the wood to split due to outward expansion of the “cake” when the bowl is cooling after use. The ideal carbon thickness is 1.5mm. 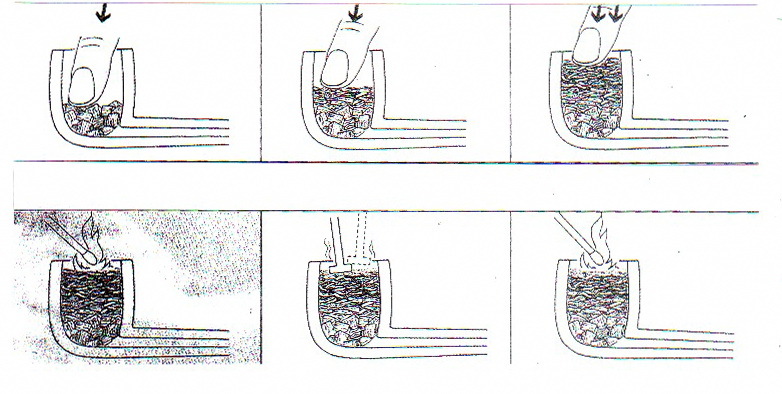 Whilst a pipe should be emptied immediately after smoking this should not be done by hitting or knocking the top of the bowl against a hard surface. The latter may result in a cracked or split pipe. In order to gain the maximum life and pleasure from your pipes it is essential that you take proper care of them. They will last longer and smoke sweeter if you let them dry thoroughly between smokes. Clean them frequently and scrape them clear of excess cake when it develops. Ideally, and particularly for heavy smokers, it is recommended that you keep at least three or four pipes alternately in use. This will ensure maximum smoking pleasure and longer life for your pipe. It takes a little time to break in a pipe correctly and keep it cleaned properly, but the increased smoking pleasure will make it worthwhile.